The East Trenton Collaborative is a community organizing initiative in the East Trenton neighborhood of Trenton’s North Ward. By facilitating conversations and action on community priorities, we engage partners, support businesses, and build the power of residents to make East Trenton a great place to live, work, and play. The East Trenton Collaborative (ETC) has existed, in different forms, since 2008. An economic development organization called CityWorks launched and managed the initiative until 2014, when CityWorks had to close its doors. In 2015, New Jersey Community Capital, a statewide community development financial institution, stepped in to manage ETC. In 2018, ETC shifted its strategy and mission statement to prioritize deeper, community-driven change through community organizing. 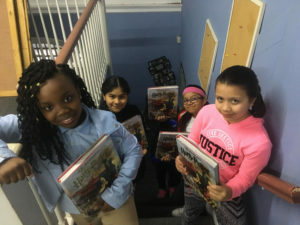 UPT operates two programs out of the East Trenton Center: Camp Grace, an after-school program and summer camp, and the StreetLeader program, which employs Trenton teens to provide tutoring and support for students K-8 and high school. Additionally, UrbanPromise Trenton leads ETC’s community organizing efforts by hosting activities and events that connect neighbors and support community action. UPT also provides leadership for the Summer Youth Employment StreetLeader Program, a hybrid StreetLeader employment program specifically designed to address teen unemployment in East Trenton. This program targets 20-25 teens living in East Trenton who are underemployed and, through grant funding, offers the teens employment in a program designed to match students with area non-profits and businesses where the businesses do not absorb the cost of employing the student. It is a well- received program entering a third year of implementation. An important aspect of SYESP is the daily enrichment activities in which the teens are required to participate when they complete their work at their partner sites. These enrichments include college level reading, financial literacy, basic nutrition information and other programs that inform and expand the student’s knowledge base. Each Friday, the students who are part of the SYESP join the SL’s from Cam Truth to participate in shared enrichments. To be part of the SYESP, students must live in East Trenton. UPT is hosting a parent information session on April 6 from 12pm-1pm at the East Trenton Center.